The rubber mulch nugget is composed of brown painted rubber pieces about ½” in size and smaller and is sourced from old tires.. This product is virtually free of white fabric and metal cords. Expect to pay about 5 to 10 times the price of traditional mulch per cubic foot. It is made from old tires. The tires are ground down by hand, by machine or frozen then broken into pieces. These pieces are then colored or left natural black. Available in 1.1 cu ft. bags only. We offer it in a brown only although you will see various colors and sizes. Some production processes include using the part of the tire which includes the white fabric cords this tends to degrade the look of the material, although our nuggets are virtually free of white fabric and metal cords. How long the color lasts varies but you should expect at least a few good years. 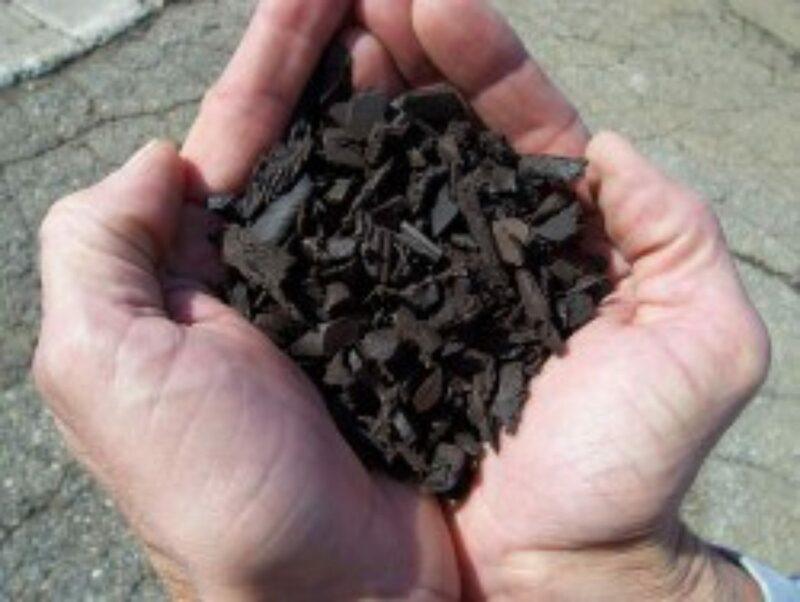 The big problem with rubber mulch is there is no cheap way to make it. While the tires used to make are a waste product the process of grinding, chipping or freezing the tires is very expensive. We offer it just it in bags only.